Gene Jones left us with a great heap of juggling ephemera and memories when he dropped off a couple boxes of his collection. 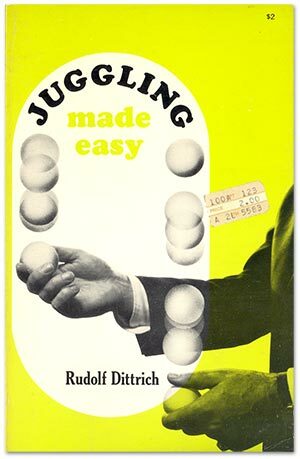 Covered in a shocking green, Rudolf Dittrich’s 1961 Juggling Made Easy is a juggling book worth getting to know. Juggling Made Easy offers enthusiastic encouragement for the beginner with playful and clear illustrations. 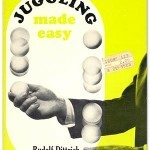 The book describes juggling as a game you can learn to impress your friends and family with at parties! Juggling banishes boredom! The book covers 2-ball, 3-ball, 4-ball, 5-ball, 7-balls, rings, clubs (including cut-out instructions on how to make your own cardboard and broom handle club), see-saw (Dubé calls it a rola-bola), knives (wood knives painted silver to look real! ), plates and disks, balancing, ribbons, feats of strength, and hats. 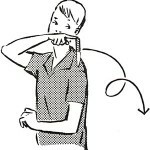 Clear and easy instructions from the juggler’s p.o.v. 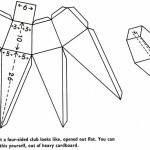 4-sided cardboard juggling club pattern to be wrapped over a broom stick. The final chapter, A Boy’s Game with Pocket Knives, seems a little tacked on, but is both educational and entertaining nonetheless. The chapter includes safety warnings but still might make a parent fear for their boy or girl’s extremities. Shouldn’t they be using wood knives painted with silver? Has YouTube wiped out the need for printed instructions? Did anyone learn to juggle from books? Copies of Juggling Made Easy are still floating around the internet. Or come by and take a look at ours, we don’t mind sharing. I learned how to juggle from a book. This was before the time of YouTube in 1994. I’m not sure that I followed the directions because I learned the shower first which is substantially harder than a 3 ball cascade. I only realized my error when I tried my first trick – under the leg – and realized it was nearly impossible. I then learned the cascade which made everything seem so easy and my trick arsenal exploded. This is why I love YouTube. 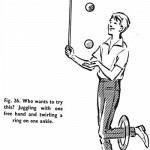 It has revolutionized the way people learn to juggle. 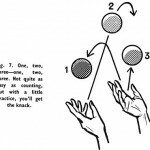 Books may be ok for learning basic juggling but I could not imagine learning advanced tricks from a book. Everything I have learned since putting that book down has been online or from watching live. I have found juggling.tv to be an excellent resource also.